Steven (Chicagoland, United States) on 26 November 2012 in Art & Design and Portfolio. The walls of the Assembly Room of Hearst Castle are lined with walnut paneling and vivid tapestries, all dating back to the 16th century. 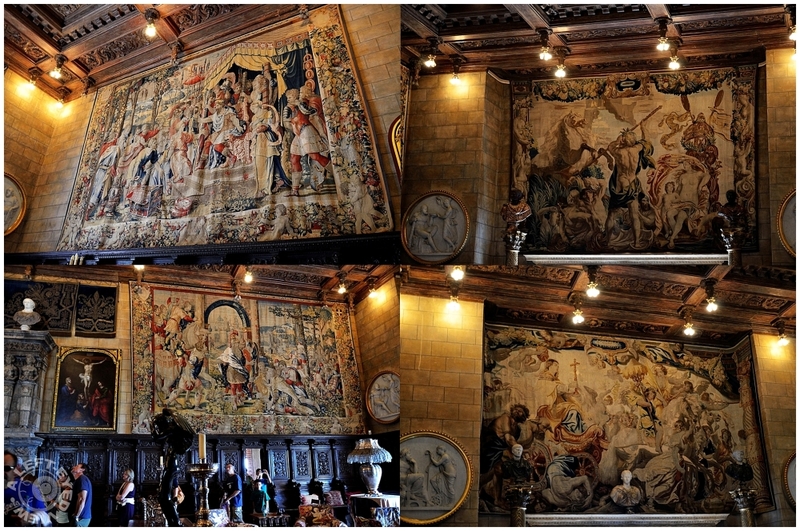 The four photos shown here illustrate four of the tapestries found in the Assembly Room. We were not allowed to use flash photography inside the residence, hence the not-so-bright shots captured here. The lighting seen hanging from the ceiling are simple incandescent light bulbs, which William Randolph Hearst was said to like and did not want covered with diffusers. Photos captured August 17, 2012. Priceless valuable treasures hanging there for generations to come and go and mavel and praise the beauty. Gorgeous! I remember visiting here years ago. My in laws lived in Morro Bay. Fantastic collection of photos ... beautiful detailed tapestries and light! Wow... very interesting place with marvelous tapestries and crowded also. Thanks for showing. These are incredible, and very well presented/lit... excellent images ! Sehr gute Zusammenstellung. Schön das Licht. Wonderful framing. Great overall white balance with these different light qualities. Excellent work. very attractive captures of these "old masterpieces", despite the limited photographic possibilities ! great pictures. I was just there a few months ago. I was wondering what Camera and what lens? @Martin: Martin, the camera is identified to the right of the photo (Nikon D7000). The kit lens was used which is 18-105mm.